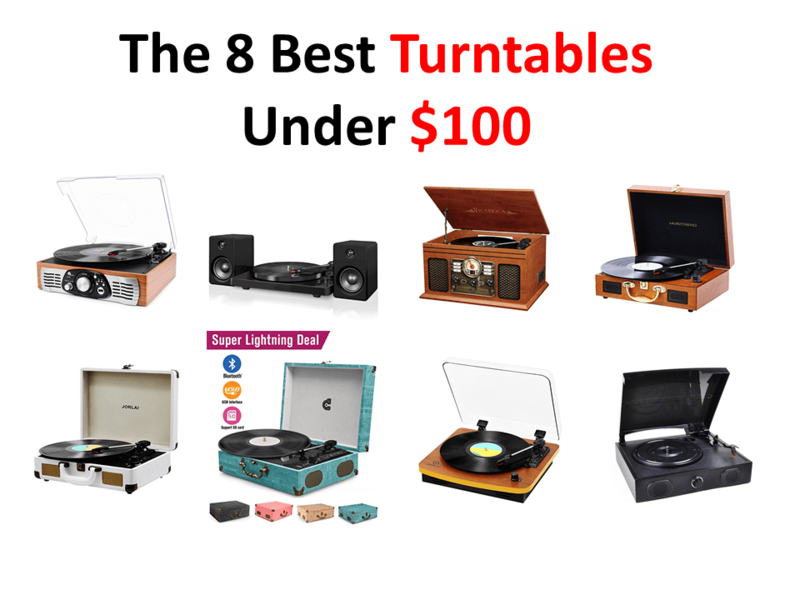 Today I have for you some of the best turntables under $100. Listening to music on vinyl is huge these days and it is one of the few parts of the music industry that has grown the last few years. I have been collecting vinyl for a few years now and when I first got into it, I purchased a budget priced turntable and I was happy. This was a great way to dip my toe back into collecting vinyl. That is why today I am looking at some lower priced turntables which are aimed at the person just starting out on the awesome journey that is, vinyl collecting. 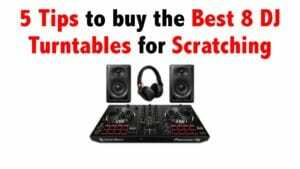 I wanted to share a few of the common things that I feel you need to look for when you are buying a turntable. Even the best turntables under $100 are going to have to cut a few corners here and there in order to keep the price down. Speakers: Some of the lower priced turntables do not actually come with speakers. 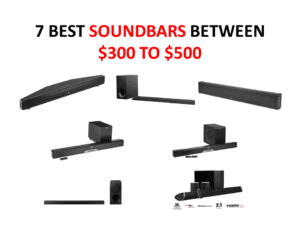 So make sure the one that you are looking at comes with speakers or at the very least you have a set of speakers that will be compatible with it. Bluetooth: Bluetooth connectivity is all the rage these days and many turntables are getting in on this. How does Bluetooth on a turntable work? Well, you hold your record up and it beams the music directly to the turntable…. I am joking! Really, Bluetooth on a turntable will mean that it can connect to Bluetooth speakers or that you can connect your phone to the turntable and use the speakers that are on it to stream music from something like Spotify through it. Have Realistic Expectations: Some of the turntables that I am looking at today cost around 50 bucks! You have to make sure that your expectations are realistic. These are not going to make it sound like Jon Bon Jovi is in your living room. These types of turntables are aimed at those who are just starting out collecting vinyl. Over the last couple of weeks, I was given the chance to check out some of the best budget priced turntables on the market. I had a great time listening to some of my favorite albums on these turntables and I will be giving you my honest thoughts on each one. I have also handpicked a three more turntables that I did test out, but as they are popular, I felt they were worth taking a closer look at. I really like the retro design of this turntable. The front of the turntable looks like a radio from the 1950’s and I think that is pretty cool. It has a nice and clear plastic lid that feels quite strong and in general the style is just really cool. 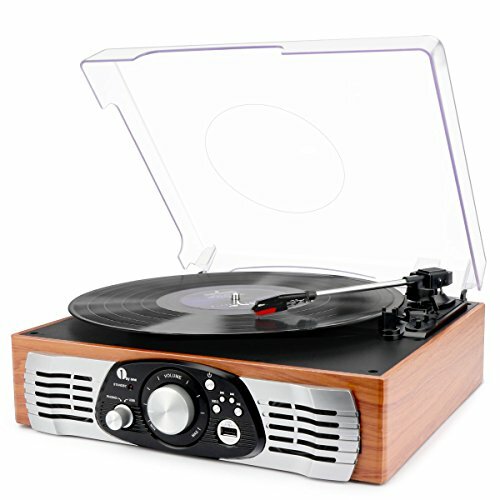 It is also currently being sold for around 50 bucks so it is a great entry level turntable. You get all you need with this turntable. 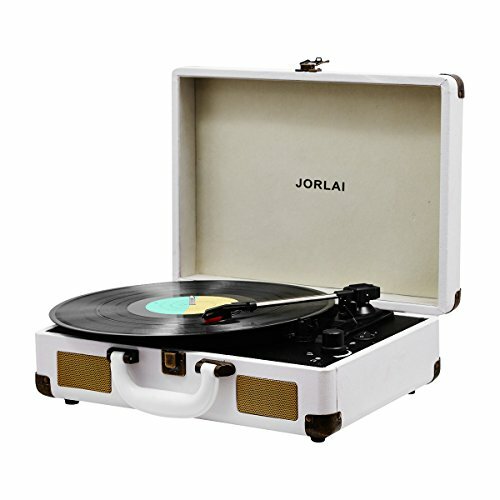 It has built in speakers so as soon as you get this, you can start listening to your favorite vinyl records. It has multiple speed settings so no matter if you are listening to some Metallica or Kiss, you can make sure it is set just right. While it does have built in speakers, it still has jacks on the back so you can connect higher quality speakers if you want. It also offers USB playback so you can play music from a memory stick if you want…. Why you would want that I do not know, but it is nice the option is there. This turntable is being sold for a great price and would make a great first turntable. The style of this one is very, very cool. It is modern, almost futuristic with its design. Kind of like something from the movie Tron! It is a nice white design and the speakers are not actually part of the turntable which I think is pretty neat. One thing I will say is that while I love the white version I was sent, this does come in other colors. Setting up the speakers is very easy and it actually came with the cables to do so although they could have been a little longer. You can also connect another set of speakers as there are inputs on the back to do so. One other thing you can connect to this is your phone. You can do this so that you can stream music from your phone through the turntable speakers. While the design is cool, I do wish that it had some kind of lid to keep the dust away, but then again this may make the design not look quite as cool. I ended up playing with this for a few hours and the reason for that was it did have a bit of a breaking in time. I felt that the way to get the best sound out of this is by having it right around mid level. The speakers are not the best, but doing this will get you some nice sound. At the risk of losing all my street cred, the first album I tested on this was an old New Kinds On The Block Hanging Tough album I found in a thrift store for the insane price of 25 cents and it played this old beat up vinyl record with no problems….. shame about the actual record, but hey it worked. If you want your turntable to look really cool, check this one out! Here is another one of the best turntables under $100 and it is once again from Victrola. The style of this one though is totally different. This has a real retro design, kind of like that massive record player many of our grandparents had back in the 70’s and 80’s! I think this is so cool, but I get the design is not to everyone’s taste. It kind of looks like the box Gizmo called home in Gremlins! This has it all! It is not called 6 in one for nothing. To start with it has a three speed turntable which is the main event. But it also has a radio, Bluetooth connectivity and something that really took me by surprise… a CD player! I have never quite seen a setup like this and I was pretty blown away. There is a little dial on the front that you use in order to change what you want to use and you use other speakers or headphones with it if you want. I am honestly amazed at how feature packed this thing is. It does have two built in stereo speakers and as you would expect at around 90 bucks, the sound is not the greatest. However it is not tiny like some other lower priced turntables can be so that is nice., Still if you want to listen to your music at high volumes, you may want to get a set of headphones or a higher quality pair of speakers. In all, I love this unit and feel it is perfect if you want one device that can handle all of your music needs. If you want a turntable that offers you the ability to steam music and even listen to CD’s as well, this is perfect for you! The suitcase design that this has is something many budget priced turntables go for. I love the woodgrain and black design they have gone for here and the suitcase design does mean that you would not have to have this out on display the whole time. I was impressed with how solid the whole unite felt. It actually has a very high quality feel to it as well as looking really nice. This is a three speed turntable and using it could not be any easier. The speakers are built in so it is good to go right from the start. But you can connect this to another set of speakers if you want. 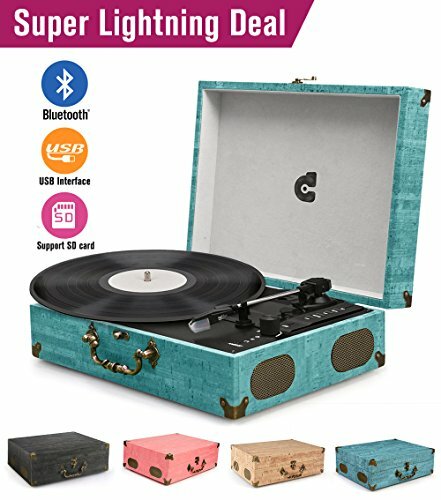 They have also included a USB port which is great if you want to connect it to a computer, which would allow you to rip your records onto the computer. In all there is nothing complicated here at all which makes it a great first turntable for someone. The sound was far better than I felt it would be, it even passed the Guns N Roses Appetite For Destruction test where I turn it up pretty darn loud. It did not get distorted so that was cool. I will say that if you want a richer more real sound, you will want to get yourself a set of more high end speakers to go with it., However if you are looking for something that is going to offer you a quick and easy way to enjoy vinyl, you cannot go wrong with this. Here is another suitcase style turntable and at a little over 50 bucks it is certainly one of the most popular budget priced turntables. This one here has a bit more of a modern style, the version I received was white, but blue is also available and as of writing it is a little cheaper. The turntable feels solid and I like how it has a handle and a secure latch to keep it closed, which if you have kids who like to mess with stuff is a nice bonus. There are two speakers on the front, so right out of the box, you can start playing some of your favorite records. There are different speed settings and you can also use headphones if you want. While the speakers are built in, there are jacks on the back you can use if you have a set of speakers that you like. It really could not be any easier to use and because of that, it would make a great first turntable or even serve someone well who has not listened to vinyl in many, many years. This does also allow you to connect it to a computer and you can use its Bluetooth functionality to connect you phone and steam music through it. Sound quality is what you would expect from something that costs around 50 bucks. It is not bad, but you will certainly want to listen to at least ten albums at about mid level volume to break it in. Some people have said the sound is rather tinny and if you have it loud, it can be, but at lower volumes it is actually good. Plus you always have the option of using headphones or even some more high end speakers. Now this one here I was not given the pleasure to test out, but when it comes to the best turntables under $100, this one is just under that 100 bucks price tag. I really liked the look of this so thought we could take a closer look. 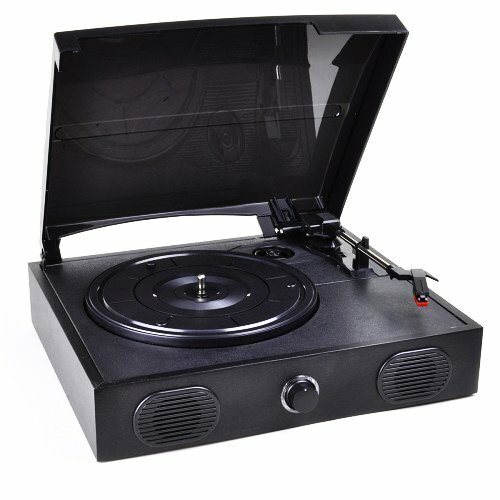 It is the record player design, but this is one of the larger turntables I have seen in that style, the record does not look like it will hang over the edge like similar models. Plus the blue and gold design makes it look like it is hiding treasure inside it! Like other turntables in the same style, this is ready to go out of the box. It has built in speakers, but what I like about this is that instead of just two like 99/100 other budget priced turntables have. This one actually has four, it has two speakers on each side and from what I have read they are pretty good. It does allow you to connect to a phone or a computer, plus it as the standard jacks on the back if you want to hook it up to a receiver or some speakers. I do like how it has actual buttons for the functions of the turntable. Of course as I did not get this one to test, I cannot say exactly how it sounds. However I did look at the reviews and many people are happy with the sound. People seem to say this is very loud and with the type of speakers they have used that is exactly what I would expect. I would suggest that any one getting this makes sure they break those speakers in properly and not just crank the volume up to max right away, even if AC/DC do sound better at volume 10! Now this thing is cool! It has a really awesome retro style with the woodgrain and the clear lid that looks like it actually fits over a record when it is on there. I would love to have gotten the chance to test this out as I really am digging the retro vibe that they have going on with this. Out of the box, this turntable is ready to rock and roll. Which by the way you should be listening to as it has a retro vibe, it is only fitting you grace it with some classic rock! Anyway, you take it out, plug it in and it is ready to go! There is no Bluetooth connectivity with this, but you can plug it into a better set of speakers or a stereo receiver if you want so that is always a nice touch. As much as I love the design of this turntable, there are many reviews saying that the sound is not the best. Which is a shame to hear, however as this is only around 60 bucks, you could always buy a set of decent speakers to go with it if you really like the style of it. I am sure for a person getting their first turntable, the sound may not be that bad, but it is certainly something you will want to look to upgrade in the future. 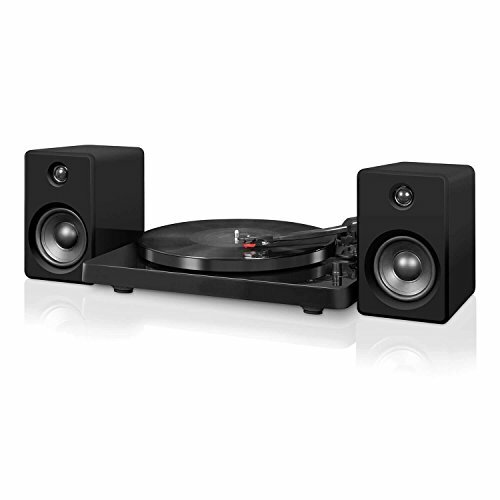 If you do not mind getting an extra set of speakers, this gorgeous looking turntable will look awesome in any room! Lastly I want to share this one with you. At a little over 30 bucks, you will struggle to find a cheaper brand new turntable than this. I thought we should look at it as some of you may be looking to get into vinyl collecting and want to spend as little as possible on your first turntable. The design is kind of cool, it is dark black and has a pretty 80’s style to it which is something I always like. This is as basic as you get, you take it out of the box, put your record on it (well and plug it in of course) and it is good to go. It has two speakers on the front and also allows you to connect better speakers to it via the jacks on the back. It does also have a USB port so you can connect it to a computer, which at this price did surprise me. Some of the reviews for this are really harsh. As I said it costs just over 30 bucks so I am not sure what people were expecting from the sound. However if you look there are hundreds of positive reviews where people have enjoyed the sound this provides. The sound on a turntable like this is always going to struggle at higher volumes, but that is what those jacks in the back are for, so you can connect much better quality speakers to it. While not the best, if you want to spend as little money as possible, take a closer look at this. Just make sure you go in with realistic expectations. I was fortunate that none of these were actually “bad” and for the asking price I feel that they all would be a good entry into the world of vinyl. As far as the one that I liked best… well I am going to have to pick two. The 1byone Belt-Drive 3-Speed Stereo Turntable at right around fifty bucks is a great entry level turntable. It looks cool, is easy to get going and you can upgrade to better speakers if you want. 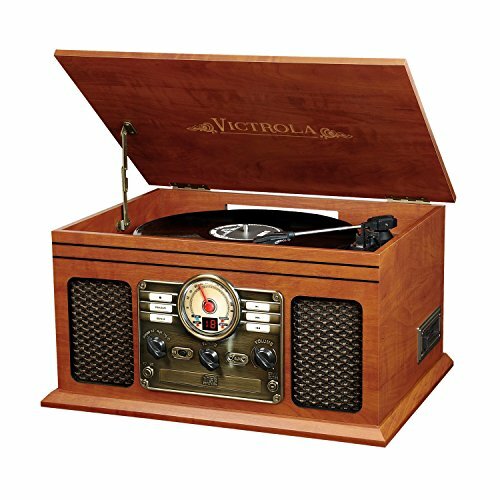 The other one I have to mention is the Victrola Nostalgic Classic Wood 6-in-1 Bluetooth Turntable which offers everything you need in a sound system. It of course has a turntable, but you can also stream from your phone to it, play CD’s and listen to the radio! 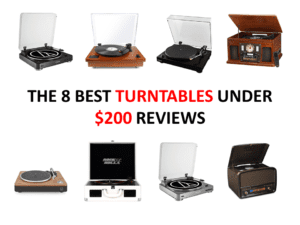 Those two are the top of the pile when it comes to the best turntable under $100.